Manufactured by Ohenry, this Pole and Stake Set is designed specifically for a 40 Foot by 40 Foot Square Mystique High Peak Tension Tent. Poles are constructed from strong, yet light weight, galvanized steel with triple reinforcement at key stress points. 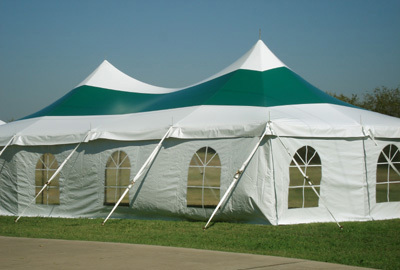 These Poles have been custom engineered for use with High Peak Tension Tents. This Pole and Stake Set include appropriate Poles, sufficient number of 42 Inch Stakes, and a handy Tent Bag for storing all components. Other sizes and accessories for your Mystique High Peak Tension Tent are linked below. This Pole and Stake Set comes complete with a 1 Year Manufacturer's Warranty.